The Bullpen luxuriously sleeps two has a sunny aspect looking south west across the meadows and orchards. The slick kitchen adjoins the open plan vaulted living area and the dining area is just perfect for a romantic meal. A sculptured stone spiral staircase leads you to the bedroom and en-suite bathroom. Arriving at Kempley was just as magical second time around to pull in off the drive and see the Barns nestling below in the valley prompted youngest grandson to want to jump out of the car and roll down the hill! Avoiding the thousand of pear trees on the way. The Bullpen is the perfect nest for two (all the grandchildren stayed with their parents in the other two Barns). Lovely welcome from Pet and Bob, nothing was too much trouble and we really appreciate your kindness to Ellie! The Bullpen has everything you need for a very comfortable stay. The pool was enjoyed by all and the play barn a great distraction for the young ones and indeed the not so young. The location was perfect, surrounded by acres of orchards and countryside yet only a short drive from many major towns and attractions. 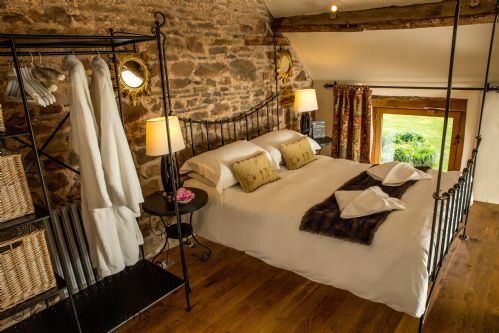 Made to feel very welcome in an immaculate, well equipped barn conversion. Idyllic, peaceful surroundings, will certainly visit again.